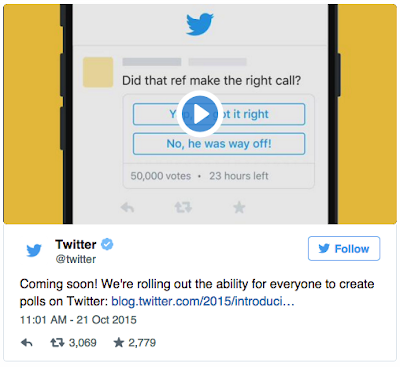 In a blog post published two days ago Twitter announced that it is releasing a new functionality that will enable Twitter users to create polls. As of right now, this functionality is not yet added but according to Twitter’s post, it is expected in the few coming days. If you are using Twitter in your instruction, this polling feature will be a great way for you to poll your students and get their feedback on topics related to what you are teaching. You can also use it with your PLN to crowdsource insights and opinions about any issue you want. Pools will enable you to both engage with members of your PLN and will also empower your students with a voice. "Previously, we’ve offered a few ways to participate in polls — Tweeting questions and tracking replies, tallying hashtag votes, or asking followers to favorite or Retweet to vote. Now, you’ll be able to create your own two-choice poll right from the compose box and it will remain live for 24 hours. You can vote on any poll, and how you voted is not shared publicly."